where else but Toastmasters can you hear the ultimate in innovation by Toastmaster Paul Edwards who has developed an unheralded technique of saying "and" instead of "uh." Where else but Toastmasters can you witness the master of visual aids Toastmaster Marshall Allington. Last meeting he held our attention by relating the armature of an electric motor with a mature arm or arm mature. One could almost imagine long gray hair hanging down from his flexed bicep.... That is if he had a bicep. Where else but Toastmasters can you witness yours truly demonstrate the exciting magical wonder of extracting and extending what appears to be... a stolen car antenna. Seriously my friends where else but Toastmasters can you develop self-confidence and the ability to stand on your feet and make a mundane subject sound intrigueingly interesting. And where else can you learn to respond spontaneously to a table topic which challenges you to think creatively. No other organization offers you so many opportunities to learn to speak effectively. Toastmasters has enabled many people to get ahead on the job or obtain a challenging position where their speaking ability is paramount. 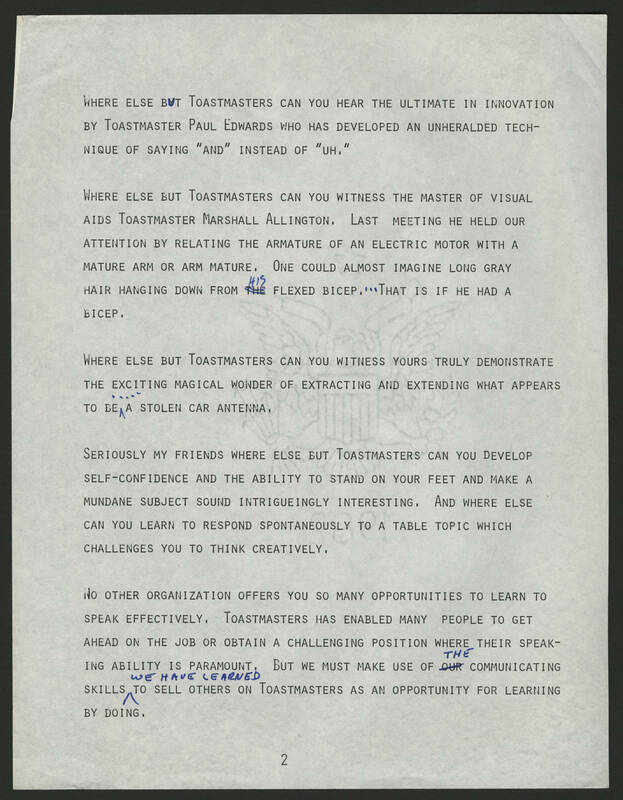 But we must make use of the communicating skills we have learned to sell others on Toastmasters as an opportunity for learning by doing.